I hope everyone had a wonderful time celebrating Christmas & New Year! 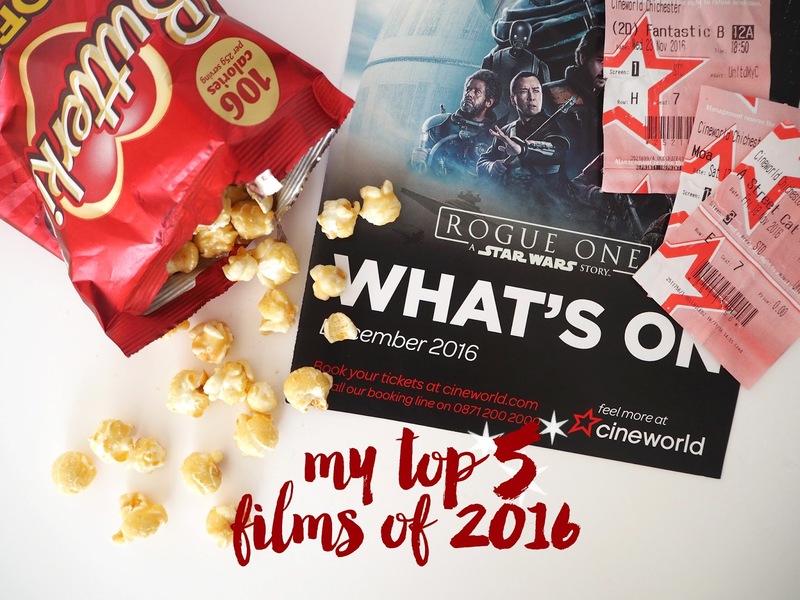 For my first post of 2017 I wanted to talk about my favourite films that I saw at the cinema last year and what I'm looking forward to most this year. 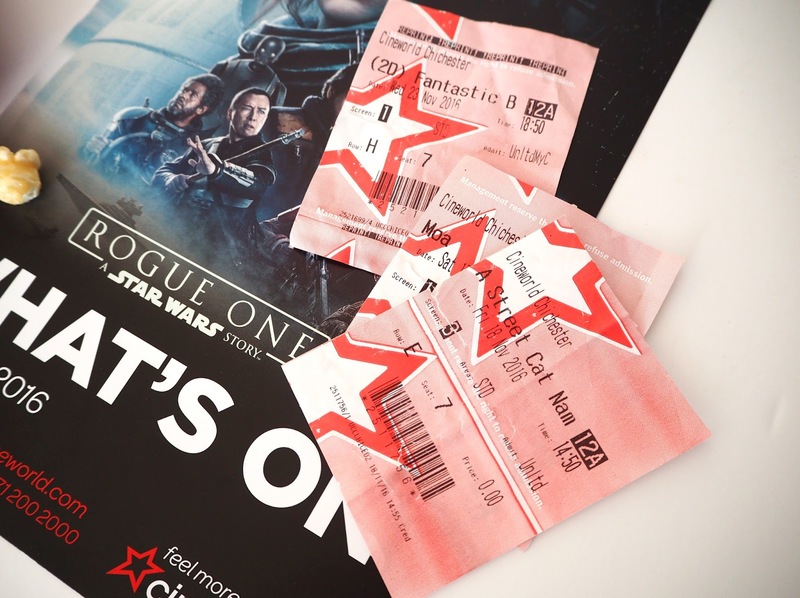 So I achieved lots of great things during 2016 but one of the best for me has been being able to manage going to the cinema again. For most this may see like a fairly standard thing to be able to do but for me it's still a novelty! As some of you are aware I have a condition called Ehlers Danlos and the chronic joint pain I experience from it has made it difficult for me to get out and do a lot of things including sitting through a film in the cinema. However since last June I have found I can manage the seats at my local Cineworld as they are high backed so I can take neck support. I do have to bring a fair amount of things including a cushion to support under my knees, my back, a neck pillow as well as wear lots of my pain patches in order to manage! But the fact is that I can do it now so to me it doesn't matter and I'm lucky that the people I generally go with don't seem to mind about helping me take everything, they're just happy I can finally join in! Some other notable films I saw last year that aren't in my Top 5 include: Tarzan, The Boss, Absolutely Fabulous, Finding Dory & Passengers. So onto my Top 5 Films of 2016! Now as a pre SPOILER WARNING for those of you who haven't seen the following films, I will be giving away some of the content (nothing too major I don't think!) so only read on if you've either already seen them or don't mind a few spoilers. All of these films I enjoyed seeing so much and have really great memories from, I have already pre order every single one on DVD. I have to say there is not much between my top 3, I struggled to order them to be honest! 5. Trolls | Alright, so maybe this is technically aimed at children but I'm a child at heart & if it's enjoyable who cares?! Some of my ultimate favourite films are from Disney, Pixar & DreamWorks. I went to see this in a group of four friends (and fellow children) for a light hearted evening and we just smiled and laughed the whole way through. The songs are really great with the fantastic voices of Anna Kendrick & Justin Timberlake as the lead Trolls, plus Zooey Deschanel who I didn't realise could sing so well! 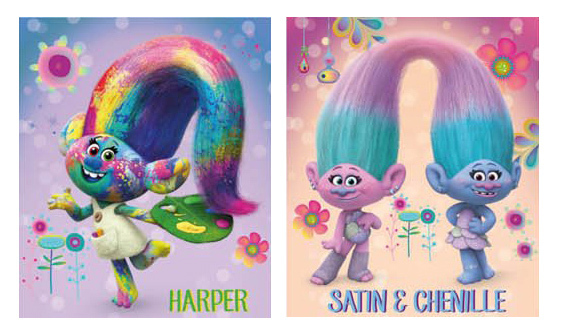 They created so many different kinds of Trolls for this film but my favourites were the ones with the rainbow hair (pictured above). The storyline is a fun colourful adventure where Poppy (the lead troll) has to rescue her fellow Trolls from being eaten by the Bergens (the bad guys), King Gristle had us continuing to laugh on the way home! It has some adorable characters and a few very touching scenes such as my favourite 'True Colours' scene. It's such a tonic of a film, just a happy, bright, explosion of joy & rainbow sparkle! Overall I left the cinema feeling so happy that I immediately decided to pre order it! I've also recently become obsessed with the game Trolls: Crazy Forest Party - it's addictive. 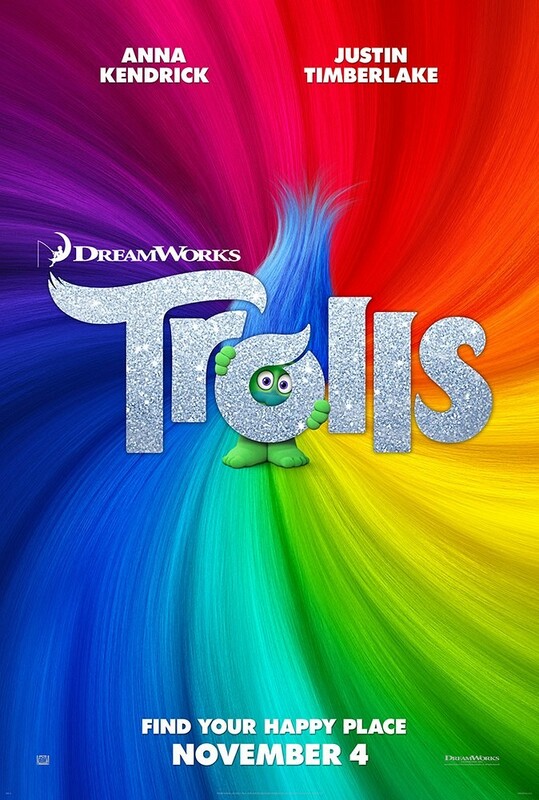 "DreamWorks Animation's Trolls is an irreverent comedy extravaganza with incredible music! Starring Anna Kendrick as Poppy, the optimistic leader of the Trolls, and her polar opposite, Branch, played by Justin Timberlake. Together, this unlikely pair of Trolls must embark on an adventure that takes them far beyond the only world they've ever known." 4. Moana | I told you I love Disney films! So I'd heard Moana being describing as the biggest film since Frozen and I thought, yeah right. In actual fact this film blew me away so much I went to see it twice! It's an incredibly heart-warming adventure with the beautiful Hawaii as it's backdrop. You see Moana as an adorable little toddler being chosen by the ocean to be the one to restore the stolen heart of goddess Te Fiti. I loved how they actually made the ocean a character in the film, it's really clever. 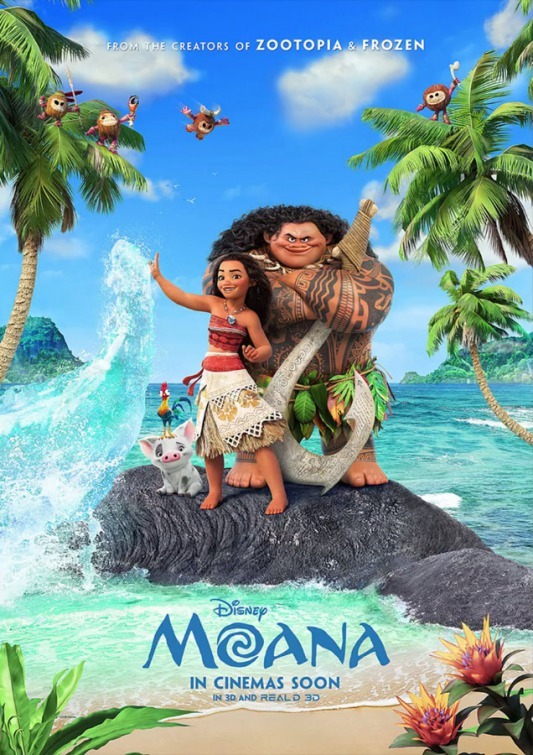 There are some 'classic Disney' emotional moments between Moana & her Grandmother & at the climax of the film as well as they comedy mostly provided by Demigod Maui, voiced by Dwayne 'The Rock' Johnson (another one I didn't realise could sing!). I particularly loved how this Disney story wasn't the typical princess meets prince, gets together against the odds then lives happily ever after. This is an empowering story of a young heroine who proves she can save the world all on her own, a great message for little girls I think! As for the soundtrack, it's simply amazing! Every single song is memorable, catchy and has great heart. Dare I say it is my favourite Disney soundtrack ousting Frozen?! "A thousand years ago the shape-shifting demigod Maui stole the heart of the island goddess Te Fiti - the bringer of life. This act leads to a darkness spreading across the ocean and it reaches the island of Motunui where a young woman - Moana - is the heir to the chief. Crops are failing and fish have disappeared from traditional fishing grounds. Moana has to defy her father's orders and sets sail beyond the reef, looking for Maui and to return the heart back to Te Fiti." 3. 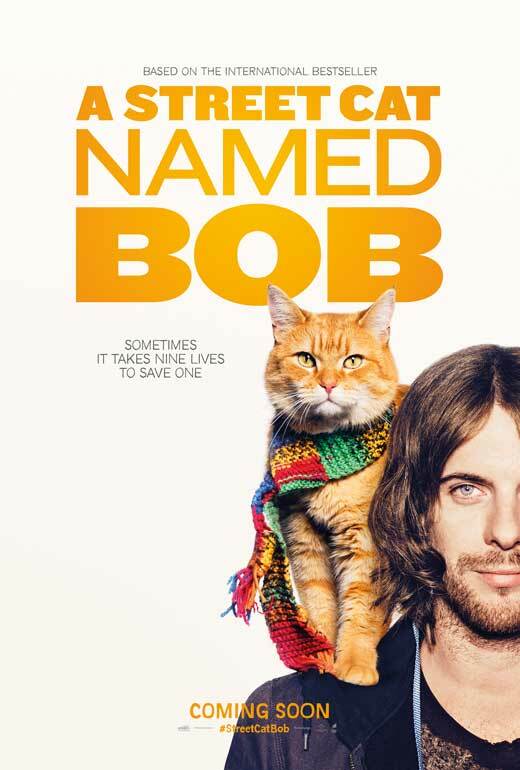 A Street Cat Named Bob | Ahhh even just thinking about this film makes me feel emotional! I am a massive cat lover/crazy cat lady/cat mama so it immediately appealed to me. My Mum had already read & fallen in love with the book that this story is based on, a true story, and told me about it. We decided to go together to see it in the cinema. Now don't be fooled into thinking that just because it features a cat it's a cute & fluffy film, the subject matter is a serious one. James is battling drug addiction and surviving on the streets, homeless and with no support. It's only when a social worker helps him find housing that he finally starts to get a break and Bob, a determined ginger cat, comes along and by not leaving him alone (however many times he's rebuffed) aids in giving James his second chance. Luke Treadaway portrays James Bowen incredibly & believably in my view with some very moving scenes with his father in particular. I don't often cry in the cinema but I will admit I started tearing up when Bob goes missing (imagining the same thing happening to my own cat back at home I think) even though I knew he would be alright! It's a powerful & moving adaptation and there are some harrowing scenes with drug overdoses and methadone withdrawal so it's not for the faint hearted or very young children I'd say. All the time though Bob (who plays himself in almost every scene of the film by the way) is by James' side giving him something to care for and remain on the straight & narrow. Keep your eyes peeled for a rather poignant cameo of the real James Bowen at the end! As you can probably tell by now I love a movie soundtrack and this one is beautiful. I find it quite emotional listening to some of the songs, my favourite being Satellite Moments which James sings whilst busking. The nation have fallen in love with James & Bob's story & unique friendship and goes to show that a big budget & CGI don't necessarily bring you the best stories. Cat lover or not it is the most heartwarming, thought provoking & uplifting film of the year! I think it will help make a few more people stop when they see a Big Issue seller from now on too. "Based on the true life story and international best-selling book, A Street Cat Named Bob is a moving and uplifting film that will touch the heart of everyone. When London busker and recovering drug addict James Bowen finds injured ginger street cat Bob in his sheltered accommodation, he has no idea just how much his life is about to change." 2. Bridget Jones Baby | I've been so looking forward to this film being released this year although I was concerned it may not love up to expectations, with the first two film so beloved. I needn't have worried though! Renee does a fantastic job reprising her role as unlucky in love Bridget Jones, now 43 and having split with her true love Mr Darcy (Colin Firth). Handsome newcomer Patrick Dempsey was a very welcome & refreshing addition to the cast I thought, fitting in well with fabulous comic timing. One of my favourite parts is probably at the (hysterical) musical festival, look out for a cameo by Ed Sheeran. I thought the storyline was really well done considering the 'who's the daddy?' plot has been seen so many times before. I felt they still managed to keep it fresh and I think the fact that everyone already cares a great deal for the characters helps a lot! I know some people were disappointed that Hugh Grant didn't return for this film personally I didn't feel his presence was missed, there were a few fun nods to his character though! The supporting cast was excellent with many of the cast from the first two films reprising their roles including her parents, old friends (Shazzer being my favourite) and the hilarious new addition of work friend Miranda which I thought was particularly great! Some of the scenes in the news studio had me in stitches. My absolute favourite addition has to be Emma Thompson though as Bridget's sarcastic Doctor, with some classic one liners that had the cinema erupting with laughter! I went to see this twice in the end, once with one of my best friends and second with my mum, sister & cousin. It's laugh out loud funny, I particularly appreciated being able to see this one in the cinema as being surrounded by everyone else in laughing throughout made it even more enjoyable! One moment in particular, towards the end, had me absolutely weeping with laughter! You'll know which part I'm sure if you've seen it. In my opinion it's actually the best of the trilogy and I cannot wait to re-watch this again over & over once my (already preordered) DVD arrives! 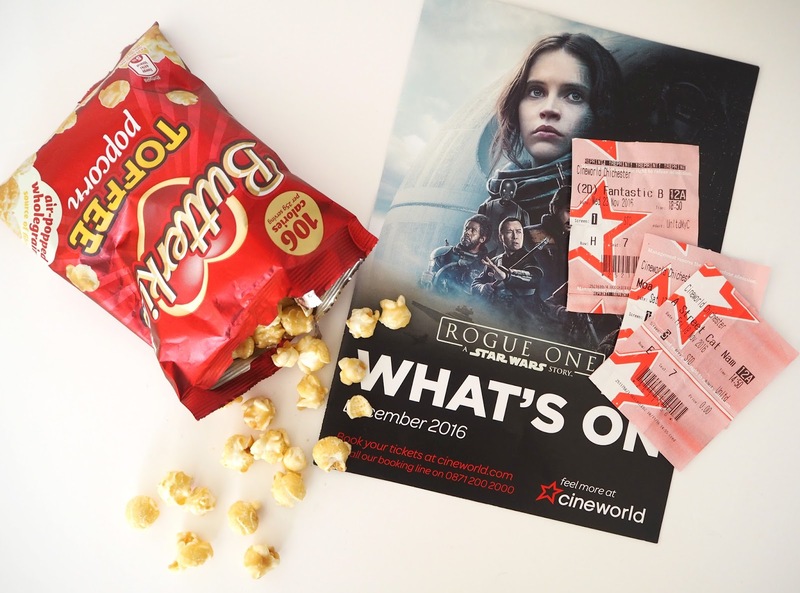 A must see if you loved the original Bridget Jones films. "After breaking up with Mark Darcy, Bridget Jones’s “happily ever after” hasn’t quite gone according to plan. Fortysomething and single again, she decides to focus on her job as top news producer and surround herself with old friends and new. For once, Bridget has everything completely under control. What could possibly go wrong? Then her love life takes a turn and Bridget meets a dashing American named Jack (Dempsey), the suitor who is everything Mr. Darcy is not. In an unlikely twist she finds herself pregnant, but with one hitch…she can only be fifty percent sure of the identity of her baby’s father." 1. 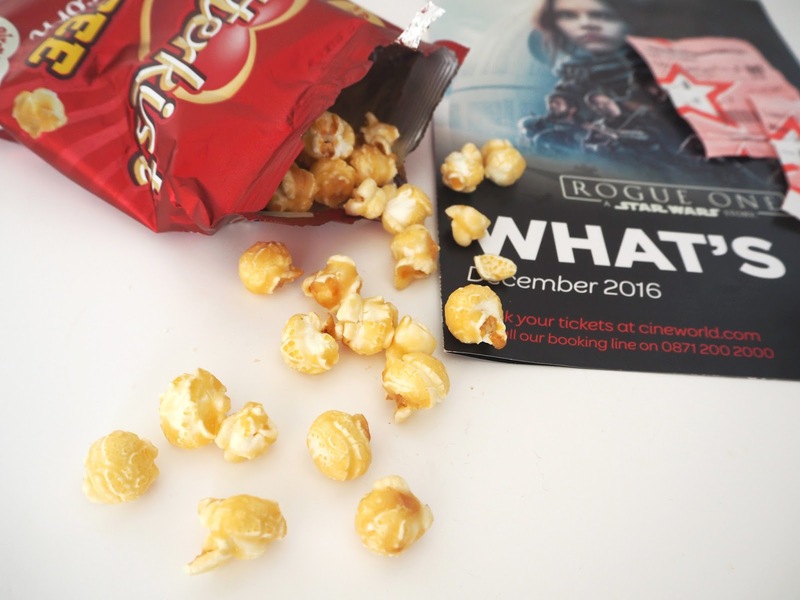 Fantastic Beasts & Where To Find Them | This is the film I've been waiting for all year! There was so much anticipation and, for me anyway, it totally lived up to it and more. I felt it completely recaptured the magic that was in the first two Harry Potter films. I loved Eddie's portrayal of Newt's nerdy, slightly awkward character but with such a love for these extraordinarily creatures. The Mary Poppins style suitcase where all the creatures lived was so enchanting and Jacob was a highlight for me as the funny, loveable No-Maj (Muggle) sidekick. There are also love interests for both Newt & Jacobs characters which I'm looking forward to seeing develop in the later films. As a massive Harry Potter fan & purest I have always loved the books so much more than the films. I have to once it gets to Goblet of Fire onwards they start leaving way to many important parts out and straying away from the story & characters I love. 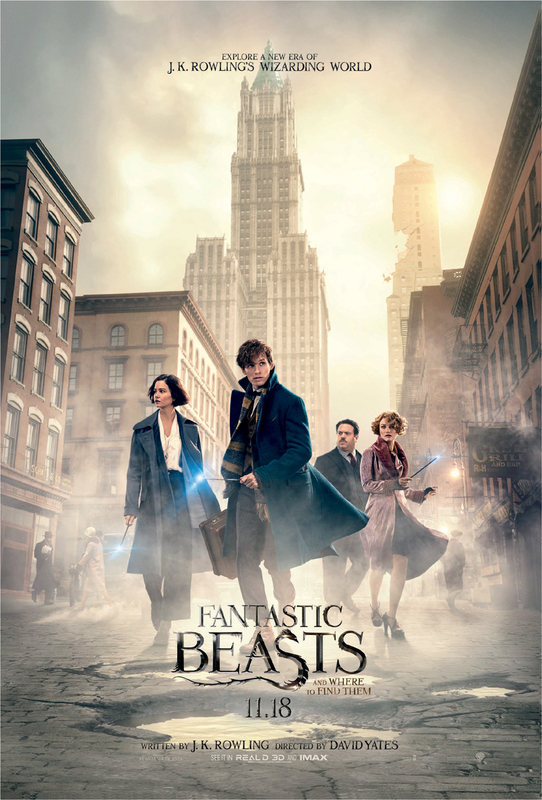 Fantastic Beasts however is a completely new story (set in the 1920's) from JK Rowling, based on a Hogwarts text book, and hence why I didn't find myself feeling frustrated or disappointed in any way with this film! It's the first time we're going into the cinema with no idea how the story is going to go, and I really like that. It is basically a prequel to Harry Potter so you don't need to be a massive fan to go and see it, you don't even need to have read the books or seen the films before I don't think! I've been saying this to my non Potterhead friends & they said that actually encouraged them to go and see it more and they really enjoyed it too. You won't be confused by the storyline as it's completely fresh. On the other side of the coin if you are, like me, a massive Harry Potter junkie then that will only enrich your experience when watching this film. There are lots of references littered throughout the film to things, mostly from the books actually, so if you're a book fan you'll pick up on them. Many of the magical creatures featured (such as Nifflers, Bowtruckles & Demiguise) are mentioned in the Harry Potter books, plus little mentions of Dumbledore & Hogwarts as well as featuring heavily the dark wizard Grindlewald - a character they never explained properly in the HP films! It was amazing seeing the creatures I'd only imagined in my head brought to life on screen. The adorable jewellery stealing Niffler stole my heart, he was just so cute! I reckon they should create bags & rucksacks of the Niffler & you can put you things in his pouch (Warner Bros I'll take 10% commission on that idea, thank you! Haha) I'd totally buy one. I would have loved to have watched this more than once in the cinema but it was the longest film I've sat through so far (2 and a half hours with trailers) and I really struggled with my pain so I decided to be sensible and just wait for the DVD. This is the first of five films planned and I'm so excited about all the magic we have to look forward to! I've heard they have already cast a young Dumbledore for the next film. Also if you haven't already heard the theories flying around about Ariana Dumbledore being an obscurous them goggle it now as it makes so much sense and I can see that being exactly the kind of thing JKR would do - extending the background of characters we already know! In my head I'm thinking the last film will end with the legendary duel between Dumbledore & Grindlewald tying things up for those of us who always wished to know more about that! So if you haven't seen Fantastic Beasts yet what are you waiting for?! "The year is 1926 and Newt Scamander has just completed a global excursion to find and document an extraordinary array of magical creatures. Arriving in New York for a brief stopover, he might have come and gone without incident...were it not for a No-Maj (American for Muggle) named Jacob, a misplaced magical case, and the escape of some of Newt's fantastic beasts, which could spell trouble for both the wizarding and No-Maj worlds." Films on my 'To Watch' List for 2017 include: La La Land, Sing, Lion, Pitch Perfect 3, Bay Watch & right at the top of the list is the long awaited Beauty & The Beast released in March! I literally cannot wait for this one.